This is my version of a balancing act. Crochet granny square middles on the arm of the couch. Both rings off my fingers & placed on the arm of the couch. There was a cuppa tea there as well, but I sensibly moved this. Note to self... get a side table for next to the couch! 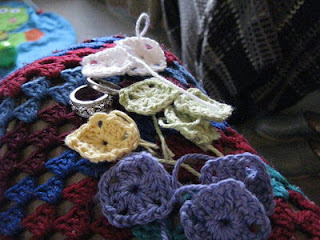 Did you know that I can't crochet with rings on... weird. Can you? Often my couch arm will look like this too! You wait, another couple of months you won't be able to leave anything anywhere with Bubba Joe on the move! No, me neither! They twist round and get in the way. I also can't crochet with my charm bracelet on! I would say a side table is definitely in order!